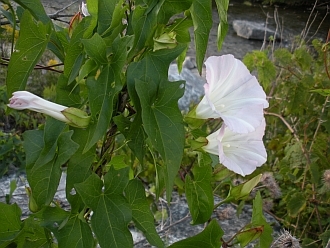 Hedge Bindweed, Calystegia sepium, is a member of the morning-glory family, Convolvulaceae. It is a climbing, twining, perennial with attractive, large, flowers. The flowers are generally white but sometimes have a pink tint. They are funnel-shaped and can reach 3" in length. The leaves are large, triangular in shape and have pointed tips. Although native to our area, their aggressive growth habit makes them somewhat of a nuisance. They can reach ten feet in height and smother the plants they are growing on. Their huge network of creeping rhizomes, plus a taproot that can be up to ten feet in length, can make them very difficult to remove. They are also allelopathic, releasing toxins into the soil that inhibit or retard plant growth. 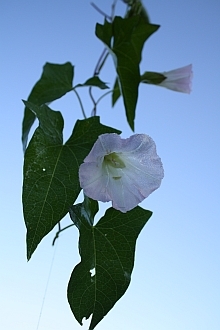 Hedge Bindweed is often confused with another common wild morning-glory, Field Bindweed, or Convolvulus arvensis. 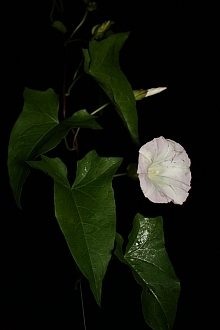 Field Bindweed is non-native, has smaller flowers and leaves, and prefers more open areas. It is easily differentiated from our native species by inspecting the leaves. In C. sepium, the base of the leaf has two points, or 'dog ears,' whereas the base of a C. arvensis leaf comes to a single point. In the 60's, it was a fad to crush the seeds of the popular garden variety "Heavenly Blue" morning glory and consume them. In small quantities the seeds produced hallucinations. In large quantities they were poisonous. The seeds of our native morning-glory have the same hallucinogenic effect. C. sepium blooms in our area from June to September.